Now accepting applications for positions on our 2019 Holiday Park Ski Team. 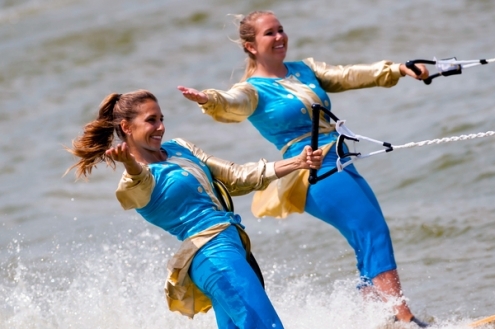 Next year marks 37 years of water skiing in Germany at the highly acclaimed HP Ski Show. If you are interested in European travel, if you are interested in experiencing another culture, if you are interested in performing in the world famous HP Ski Show, you should apply! To bring outstanding entertainment to audiences of all ages while focusing on quality, teamwork, employee commitment and innovation. To strive to greatly exceed the expectations of our clients, their guests and each other. By producing spectacular live action ski and stunt shows that are cost effective and have an immediate high marketing impact for our customers. By thoroughly training each team member and by being the industries leader in safety management and innovation. By encouraging ideas from each other and guests; By demonstrating our appreciation for contributions through recognition, reward and growth opportunity; By reinvesting in people, innovation and product; By setting the example as the community and industry leaders.